It’s almost the end of July already–ack! That means it’s only about a month until school starts again. That also means school shopping, getting oldest child to apply to colleges and get his senior pictures taken, athletic meeting for school, orientation for incoming sophomores to the senior high school, and I’m sure a whole lot more. Harvest is in full swing. 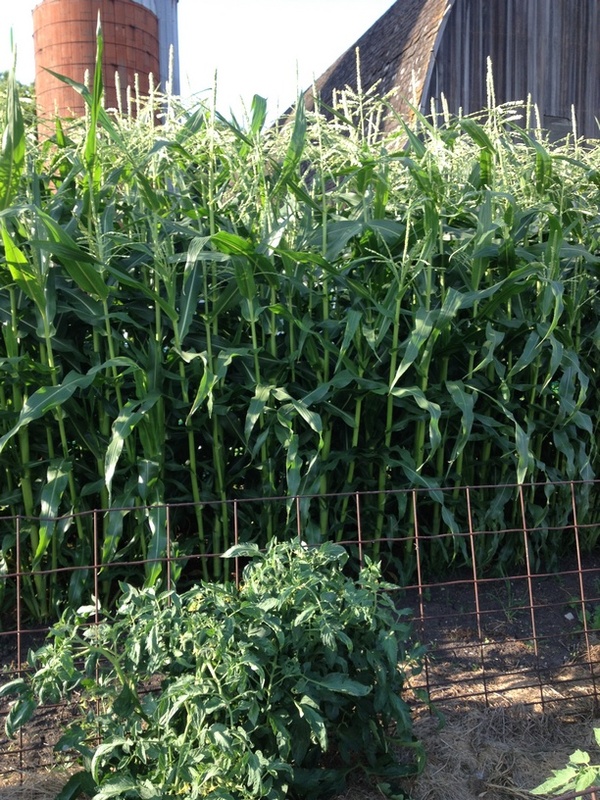 My early corn is at the “pick me” stage, but we’ve had enough now that the mere thought of sweet corn just doesn’t sound like a summer treat any more. I’ve got almost enough cucumbers for my first batch of pickles (7 quarts a pop, because that’s all that fits in the canner). The zucchini and patty pan summer squash didn’t hear the order to slow it down, and my watermelon vines are spreading like crazy. The cherry tomatoes are ripening, and tasty! We had some summer storms that knocked over the towering dill and cilantro plants, so the garden really looks a mess. When I work up the courage (and pull some of the offenders), I’ll share more pics. The weeds are now officially turbocharged: the hot weather and just this time of the season trigger the weeds to seed. It’s a race I’m starting to tire of, which is pretty typical at the end of July. He smells like coconut sunscreen and lake. There’s a dark stain on his faded t-shirt that looks like he wiped something nasty on his chest. Fish guts? “Catch anything?” Maybe I can distract him so he’ll forget about my writing in his absence. Or, not writing. As usual, he’s right, but don’t tell him that. Ah, okay. Gotta go. May your zucchini be fruitful (and if you need some, I’ve got plenty!). Categories: gardening, Inspiration, Writing | Tags: creativity, gardening, humor, muse | Permalink. I thought I’d break from writing for a bit. 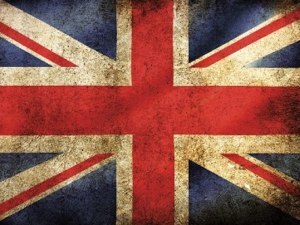 I come from a rural background. My family was the second generation removed from the farm; my maternal great-grandparents were farmers. In fact, someone found a newspaper article from the twenties (?) describing my great-grandfather’s death by farm accident. I mean, heck, they couldn’t even say “pregnant” on television, but they could write a play-by-play of a farmer’s death struggle with a power auger. You won’t find description like that in newspapers these days. When I was growing up, everyone had a backyard garden. The neat gardens belonged to retirees, because they were the only ones who had time to weed that well! We had three gardens at our first house, then when we moved, we had one main garden and a secondary one that lasted a couple seasons. Cucumbers, zucchini, and Brussels sprouts. Bottom line, I grew up gardening. Even in this small town of about 2,000 people, there are many backyard gardens when one drives through the side streets. Many are flower gardens, but there are still quite a few veggie gardens around. When I worked in town, off-loading–er, I mean, sharing–excess bounty like zucchini and cucumbers with co-workers who didn’t have gardens worked, up until the point everyone was just as sick of it as I was. A few years ago, while I was attending the Write-By-The-Lake Retreat in Madison, WI, I heard something that made me realize just how different my rural upbringing was these days. 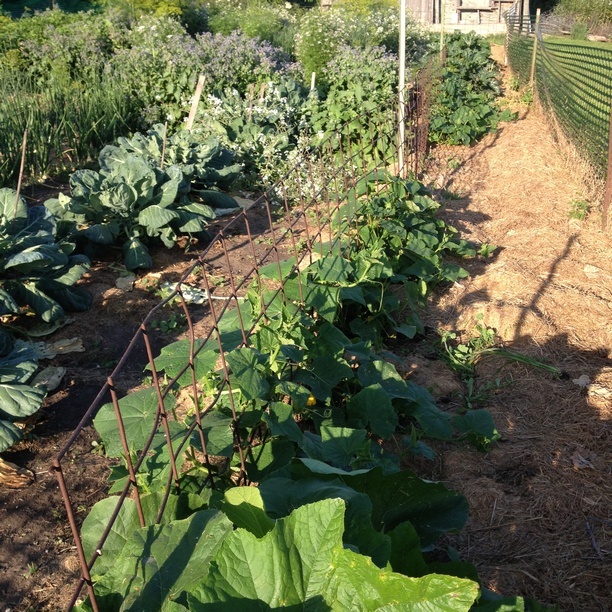 One of my writing sisters is a pastor, and she told me about the community garden she was setting up, and how hard it was to find people to help who actually knew anything about gardening. What?! After I got over the initial shock, I realized that made sense; her garden was in a Chicago area somewhere between “city” and “suburbia”. People who grew up in the city may not know anything about gardening. A foreign concept to me, but okay, I get it. Our school started a garden about 4 or 5 years ago. The ag teacher who spearheaded it even received an award for his efforts. Last year, my son got a job at the school garden. Of the five or so students that worked out at the garden, guess who knew the most about gardening and tractors besides the ag teacher? My son. Jaw drop. Seriously? We’re out in farm country, and the other kids don’t know as much about gardening as my son? Sigh. It was great for my son, who was 16 at the time, because he got the idea that maybe all those things Mom and Dad have been trying to teach him have some real world value. I still have a hard time with the idea that rural kids don’t know so much about gardening as they did when I was growing up (oh gawd, do I feel OLD!). I suppose, in this age of industrial farms and fewer family farms, that maybe kids who live in the country don’t grow up with a family garden because both parents work outside the home. It takes a lot of time to keep a garden in a state where the veggies can grow without being choked by weeds. Now I have a job in a Twin Cities suburb. The suburb is younger and less developed than most. Farm fields are within a couple miles of the major highway. The part that still amazes me is how little some of my co-workers know about gardening. I still bring my surplus to work to share, but when I have to explain what a kohlrabi is, or that dill is used for pickles after it flowers but before the seeds turn hard, I consciously remind myself that many of my colleagues grew up in a metropolitan area, without a backyard garden. On the bright side, some are nostalgic for the gardens from their childhood even if they don’t have one of their own. Some are considering planting a few veggies, or need suggestions for easy vegetables to start with. And some, I learned, are disallowed from planting a garden by the homeowners’ association in their development. OMG. I couldn’t believe it when I heard that. The first thing I thought of was one of those busy-body homeowners’ association presidents, you know, the ones that are retired and have nothing better to do than run around with a ruler to check grass height and leave notices when the tulips aren’t dead-headed fast enough. The garden can be a chore, until those first tastes of summer, the zucchini, the beets, and the cucumbers, are ready to pick. The smell of cilantro reminds me of pico de gallo, and the scent of dill is a beacon for this year’s lot of pickles. The sweet, sunshine-touched taste of fresh garden tomatoes makes the sweat, dirt, mosquito bites, and time worth it! I don’t make lemonade. Well, okay, I make it for family gatherings at my dad’s place, but I cheat every time. Pour a little powder in a pitcher, add water and ice, and stir. Easy-peasy. They even have the stuff you don’t need to add sugar to. Whatever happened to the Kool-Aid man? Me, I like ice water. Ice-cold craft beer if the kids aren’t around. I do, however, draw the line at retrieving water or other beverages for someone else unless it’s a) a family gathering, or b) my spouse (and then only when he asks nicely and I’m going to get a drink for myself anyway). And “please” is required. So, needless to say, I didn’t bring a bribe with me when I found my Muse tucked away in a hammock under the shade of the trees. Grumble. “If you’d been hounding me, I just might consider doing that. You know where the fridge is.” I am so tempted to tip him out of that hammock. Anyway, now’s the time the weeds are turbocharged. Here’s a shot of the garden. 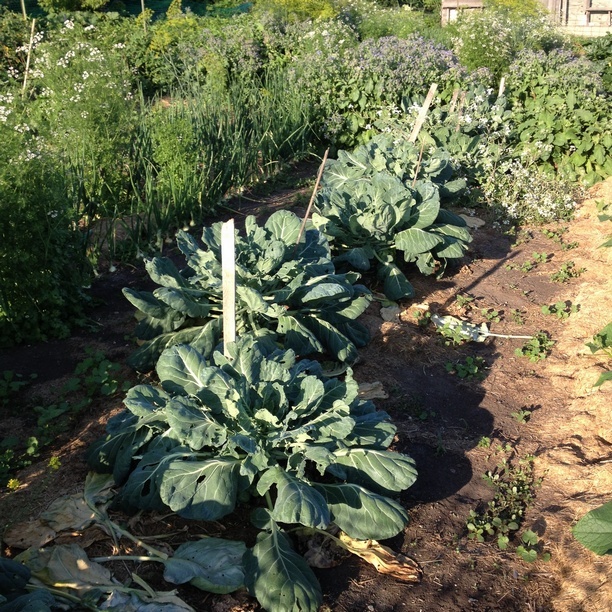 My Brussels sprouts are doing well, even under the cabbage worm attacks. We’ve already had sprouts; they get sweeter after a frost, but hey, I can’t wait that long. I let my radishes go to seed to give the bees more flowers to work with. 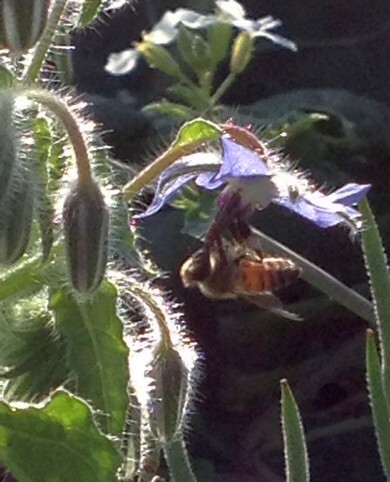 The cilantro and dill are blooming, and the borage buzzes with bees. I’m a proponent of giving the bees lots of opportunity to find nectar. We are surrounded by farm fields full of corn (wind-pollinated), soybeans (self-fertile, so needs no pollinators), and a “backyard” full of grasses, stinging nettle, and giant ragweed, all wind-pollinated. The downside? 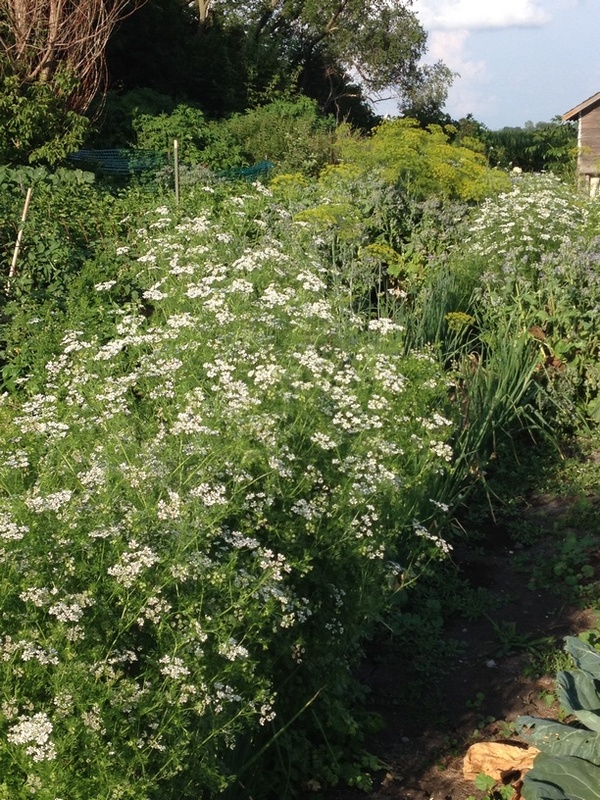 The garden looks trashy with the borage, cilantro, dill, and radishes all sprawling and blooming. I pull the radishes and borage after they’re done blooming, and let the dill and cilantro seed. The cilantro will come up again before winter. Heat advisory today, so hoping to get my pages for my writing sisters ready to send out. Enjoy the weekend and stay cool! Categories: gardening, Writing | Tags: gardening, humor, muse | Permalink.